This article was originally published on the Center for Food Safety website. We live at an age where personality cult is rife, yet there are fewer heroes. At the age of 87, the legendary organizer and United Farm Workers (UFW) co-founder Dolores Huerta is an American hero whose life’s work, amazingly, is still not done. Peter Bratt (Director) and Carlos Santana (Producer) tell her story in the new documentary Dolores, finally giving her the rightful place in history she deserves. Why isn’t Huerta a household name outside of California? Dolores sets out to answer this question while chronicling her relentless organizing and advocacy work spanning over six decades. Though she was an equal partner in co-founding the UFW alongside Cesar Chavez, she barely got credit. Oftentimes, she was the subject of blatant sexism and discrimination. Fortunately, Huerta never paid much attention to the naysayers and kept working day and night for farmworker justice. 1. Huerta is closely connected to the rise of the environmental justice movement. The documentary features archival footage of Huerta raising awareness on the impacts of pesticide poisoning during the Vietnam War era. In comparison, Rachel Carson’s Silent Spring was published in 1962. A recent article by Martin Lukacs in The Guardian explains how neoliberalism has conned us into fighting climate change as individuals. With the challenges that lie ahead for the environmental movement and mankind in general, we must revisit Huerta’s notion of “people power” and solidarity amongst groups. 2. Huerta and Chavez’s professional relationship falls into the “It’s complicated” category. In an interview featured in the documentary, the reporter asked Chavez why he picked Huerta, a woman, to work alongside him. He admitted that he preferred surrounding himself with women because they “do the work.” Despite that, sexism was rife within the UFW and for many years, Huerta was the only female Board member. Huerta called Chavez out over these issues in the media, which didn’t go down well with the UFW leadership. In the public eye, Huerta’s romantic relationship with Chavez’s brother added fuel to the fire. To this day Huerta is often referred to as Chavez’s ex-girlfriend. 3. After leaving the UFW, Huerta reinvented herself as an all-around activist. Huerta co-founded UFW but wasn’t elected president of the union upon Chavez’s death in 1993. This part of the documentary will make you cringe, but Dolores Huerta wasn’t done quite yet. She went on to create the Dolores Huerta Foundation and continues to work as an educator, organizer, and activist. In California, state offices and schools are closed on Cesar Chavez Day on March 31st. In Los Angeles, the famous Sunset Boulevard turns into Cesar Chavez Avenue. It’s about time for Dolores Huerta to receive similar recognition for her work. She clearly deserves it. Dolores is in cinemas now! 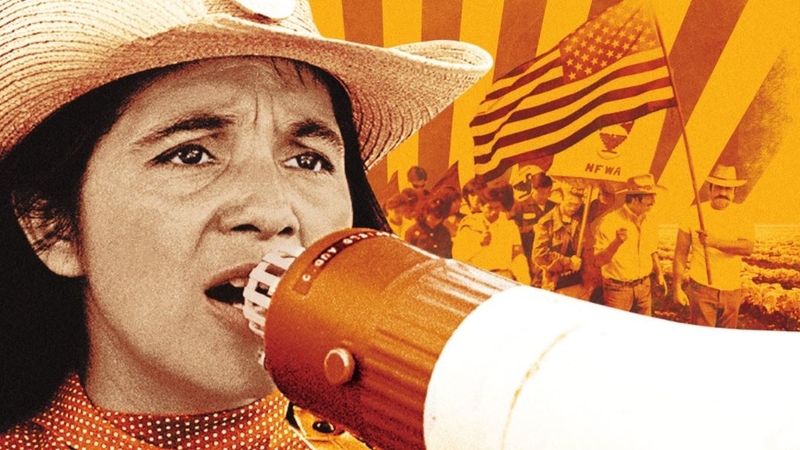 Get to know Dolores Huerta in this truly celebratory documentary. Find screenings and more information here.